G R A T I F Y apothecary showcases product label design applied to a series of 20 apothecary-style containers. various concoctions, pills and liquids are housed within. each label has a unique, hand-drawn illustration. 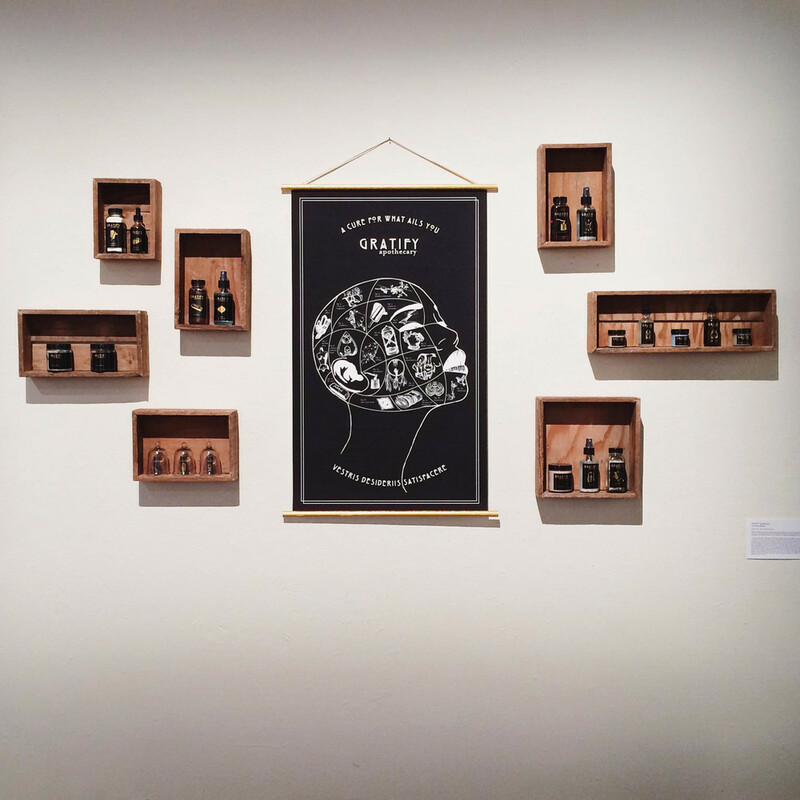 the items are displayed in wooden boxes and are accompanied by a poster. in this work the artist bottles social constructs, deepest desires and things that are not so easily accessible. she asks us to ponder what it would be like to attain things like “masculinity”, “return of innocence”, or “the power of persuasion” from a bottle and how one might feel in that reality. back when apothecaries were more popular, people would flock to them for instant gratification of all their needs, from cure-alls to love potions. nowadays we get these results from pills, fad diets, and validation on social media platforms. the artist seeks to merge these two worlds and show that human desires are more or less consistent and only the gratification of them seems to change. manifestations for the items present themselves differently to everyone, so the artist used an online survey to collect personal accounts from a variety of people. these results informed her designs and are reflected in the illustrations, contents, and are listed as the ingredients on the back of each label. the artist invites you to pick up, open, inspect each item, and reflect on what you might bottle if you could.